Jason adds that in Mexico they use chili oil on seafood. 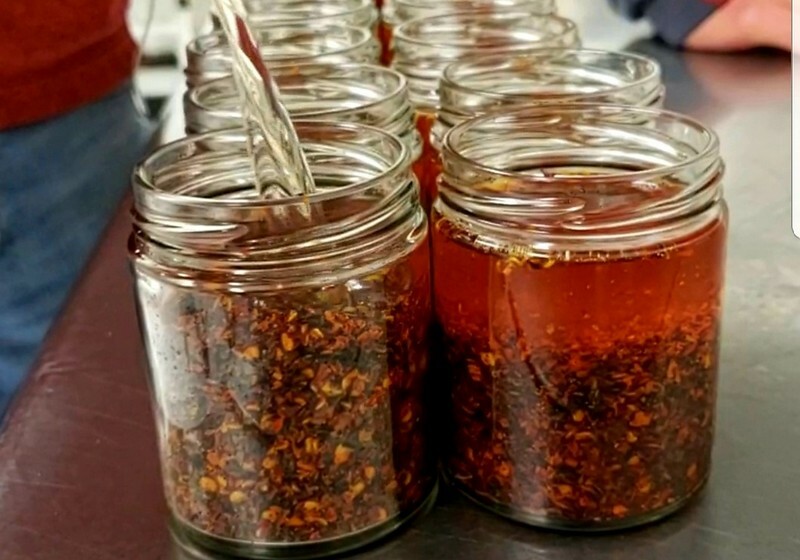 “When we moved to Utah, we couldn’t find chili oil anywhere, so we started making our own.” Their recipe was so popular with friends, that they were encouraged to start a business. “We knew this was the product we wanted to launch our business with,” he says. That business is Chili Beak - handcrafted chili oils that pack a punch! There are two Chili Beak oils - Extra Hot Habanero Chili Oil and Medium Hot Spicy Roasted Chili Oil - as well as Spicy Citrus Habanero Caramels. I’m addicted to all three. The Spicy Roasted Chili Oil is a great all-purpose oil with a roasted, slightly smoky flavor from the roasted chiles de arbol. You can use it on just about anything; I add a little to give some zing to my sauce for enchiladas. The Habanero Chili Oil is very spicy with citrus and fruit tones. Chili Beak oils are gluten-free, vegan, free of GMOs and MSG, and made without sugar or vinegar. That lack of sugar and/or vinegar sets Chili Beak apart from many hot sauce producers. Uniquely Utahan and made right here in Salt Lake City, Chili Beak uses Redmond Real Salt (which is mined only in Utah) in their products, which can be found at local businesses like Harmons, Caputo’s Markets and Liberty Heights Fresh, as well as at Amazon and on their own website: ChiliBeak.com. If you haven’t tried Chili Beak oils yet, it’s time to do so. You’ll easily transform ordinary foods into extraordinary ones!